This hair-do is very versatile. After not washing my hair for a couple of days, but still desiring a little style, I throw these easy peasy buns in. It is a great alternative to the top knot, or the standard bun. All it requires is for you to know how to twist and pin, and you're ready to go in five minutes! 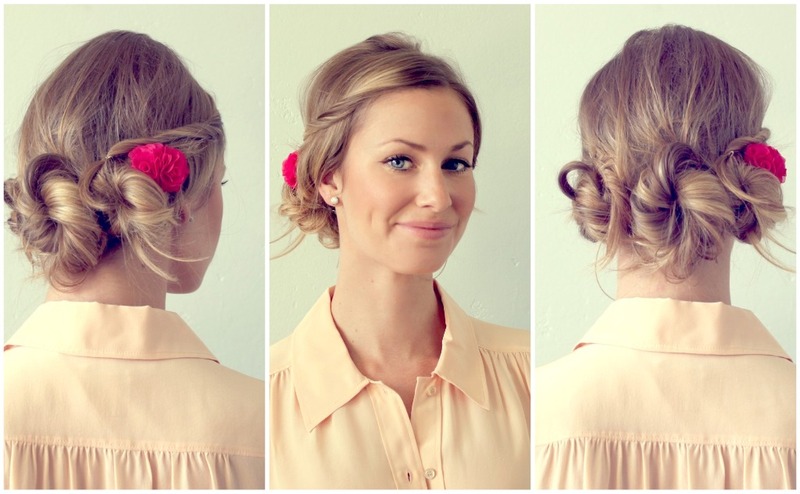 This hairstyle is also great for dressing up. I spent a little more time on it, and wore it in my previous post with that little Giambattista Valli number. Check out my instructional video below (sorry there's no sound! ), and if you do it yourself, email me a pic! I'm totally trying this hair style ASAP! LOVE it! gah, you are absolutely gorgeous!!! love this style! I love it!!! You are so beautiful!! uh!!! UM! AMAZING! :) This is gorgeous! Nice job! I never do anything more with my hair then put it in a messy bun with a loose elastic band. Not a good look! Loved this style! So good for the hot humid weather we have here in Hanoi. Thanx I always love a great hair tutorial! Awesome and it looks fabulous! my go to style quick style has been the side messy bun, super quick and versatile, but 3 buns! i need to try this! haha! okay, so i actually wore this yesterday and it's SOOOO cute!! i do a variation on this style which i call a bun-hawk (4 twisted buns like these that i do down the center of my head like a mohawk), so i love the versatility of this look!! how did I just find your amazing blog now? OBSESSED! and love this tutorial!! new follower here! Excellent, bookmarked! Especially love the flower pins, nice touch! WOWWWWW!! So interesting video!!! I'll try to do it at home!! I've just discovered your blog and I think it's amazing!!! I was watching some of your posts and are so interesting!!! CONGRATULATIONS because it's so nice!!! You are young but sooooo talented!!!! Too cute! You make it look easy! So fun! Just came across your blog via Pinterest! Love this triple bun and will definitely be trying it this week. I'm always looking for a new hairstyle, especially one that is perfect for work and play! Great blog! Very nice! Thank you for this tutorial! I am in LOVE with this. Totally trying for my cousins wedding. I am a bridesmaid and I have been looking for something easy and up since its at the end of June! I absolutely love this! Especially when it's summer in Miami - which lasts half the year - this is a no-fuss heat proof hairdo! Her hair style is very beautiful.